On Friday I woke up at 6:30 AM and couldn’t fall back asleep despite the fact I had gone to bed just four hours earlier. I was still thinking about the fiasco on I-70 and I realized I was just going to lay there so I might as well get up. I worked on the post for Thursday, watched some ESPN and MLB network, and iced my knee. I left my aunt and uncle’s place at 3:15 and stopped at the Jimmy John’s that’s a few miles from their house. I knew that I had needed gas, so earlier in the day I went to gasbuddy.com to find the cheapest gas nearby. It was at Costco ($3.69) and after devouring the Turkey Tom at Jimmy John’s I went to fill up. They’ve got a system down at the Costco gas station. There is signage telling you to only enter from one side and there are lines (2-4 cars deep) for each row of pumps. After putting in my credit card the screen read: “please insert your Costco card first.” DOH!!! Again: I’m an idiot (I’m not a member of Costco). I should’ve been suspicious when $3.69 was well below the average of the surrounding stations. I walked around to the media entrance and Kyle met me with my wristband. 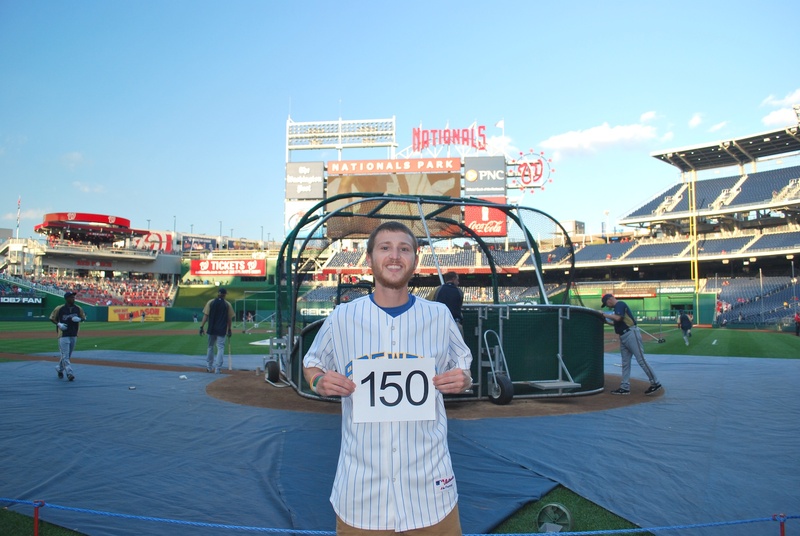 Kyle works in the Nationals Community Relations department and had invited me on the field for batting practice. I picked up my Brewers-provided ticket from will call and we headed inside. We took a few turns and went down the umpires tunnel to the field. The Brewers were already taking BP and I soaked it in. At some point I had Kyle take game photo number 150 for me. When the Brewers were done in the cage we went back up the tunnel and took the elevator to the main concourse where Kyle and I parted ways. Thanks again Kyle! 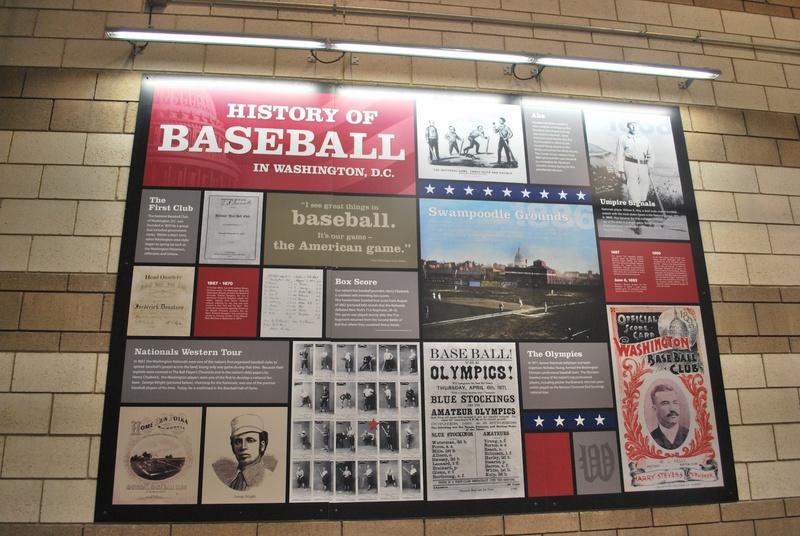 In the concourse behind home plate they have murals detailing the history of baseball in Washington D.C. There were more but I just took pictures of the first two. 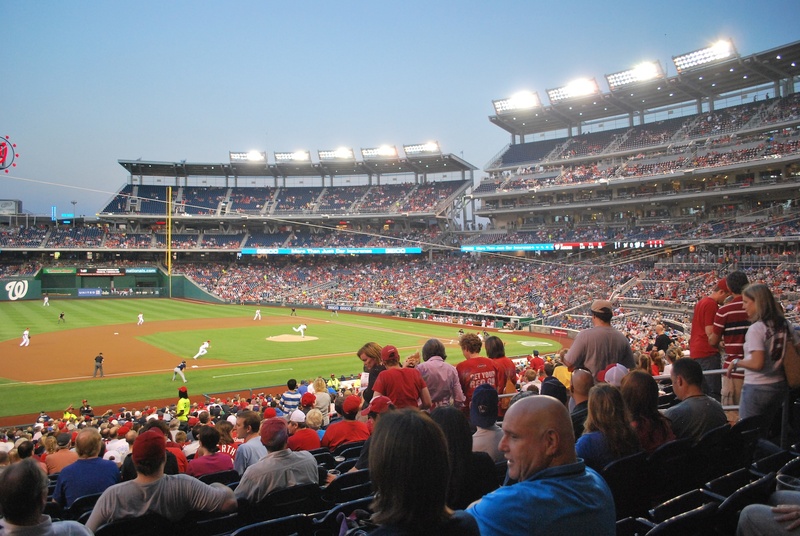 Washington D.C. lost two franchises to other cities. The 1901 – 1960 Washington Senators became the Minnesota Twins in 1961 and the 1961 – 1971 Washington Senators became the Texas Rangers in 1972. 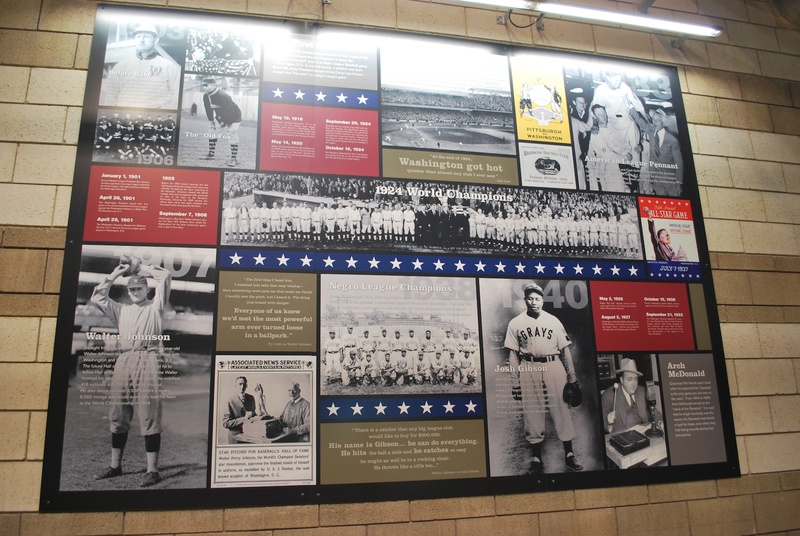 The Senators that later became the Twins won a world series in 1924, the only world series a Washington franchise has won. That’s more than the Brewers….. (so far). I wandered a little bit but then went to my seat and waited for the game to start. Eventually (and right on schedule) Edwin Jackson threw a ball to Norichika Aoki to get things started. It would’ve made for a better picture if those people were in their seats, but what are you going to do. Braun tripled with two outs but was stranded at second when Aramis Ramirez grounded out to short. The first inning wasn’t too kind to Marcum, though. A two-out broken-bat single put one on and then Adam Laroche hit a 2-run home run to quickly give the Natinals the lead. I purposely spelled it N-a-t-i-n-a-l-s there. 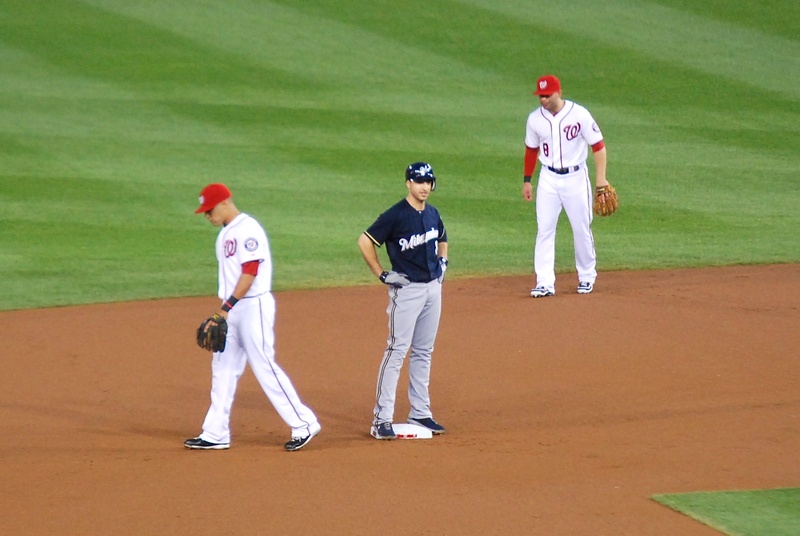 A few years ago Nationals was spelled wrong on Ryan Zimmerman and Adam Dunn’s jerseys and they wore “Natinals” on their chests for a game. They’ve come a long way. The Brewers got one back in the top of the 2nd when Lucroy led off the frame with a solo shot. I was able to get the head of a random fan going up the steps *AND* cotton candy in the same picture! The game then became a pitcher’s duel. Marcum lasted six innings and gave up just the first-inning runs while allowing 4 hits, walking none and striking out 3. Jackson’s line was more impressive: 8 innings, 1 run, 6 hits, 0 walks, and 6 strikeouts. 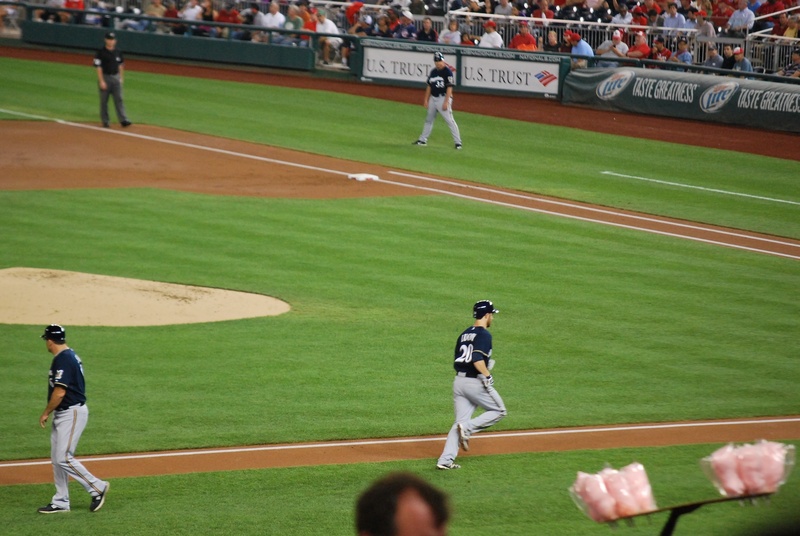 Tyler Clippard came in for the 9th to try and secure the 2-1 victory for the Nationals. At this point I moved from my seat in section 108 to above the outfield seats in left. 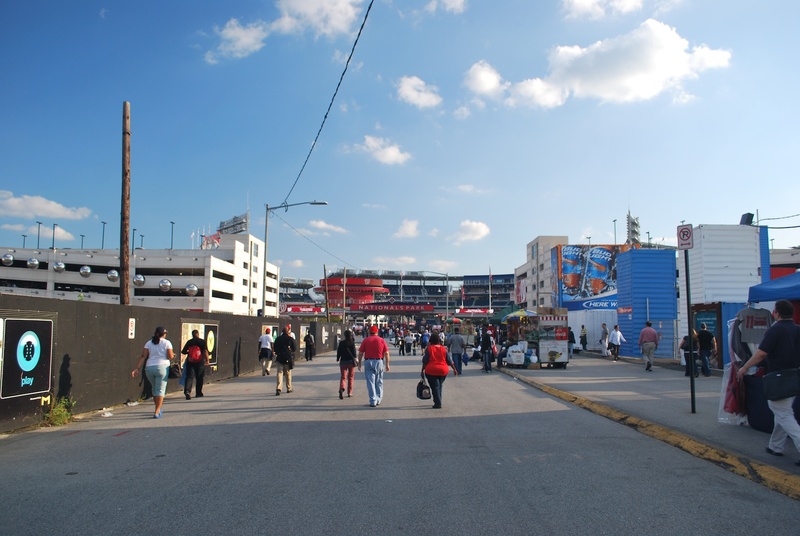 I was still hoping the Crew would make a comeback but wanted to be close to the centerfield exit so I could get to the Metro stop right after the game ended. Aoki bunted for a base hit to start the 9th and moved to second on a passed ball. Weeks flew out while Aoki tagged and moved up to third base. With Braun at the plate and the tying run at third with only out I felt pretty confident the Brewers would tie the game. Braun ripped the 0-1 pitch to left and it was a new brand new ballgame. Braun stole 2nd and then Ramirez doubled, giving the Brewers the lead in the process. A wild pitch from Clippard let Ramirez get to third. Travis Ishikawa reached first and Ramirez scored. I say reached because originally the ground ball to the shortstop was ruled a throwing error but the official scorer later changed it to an infield hit. Either way the Brewers had a 2-run lead. 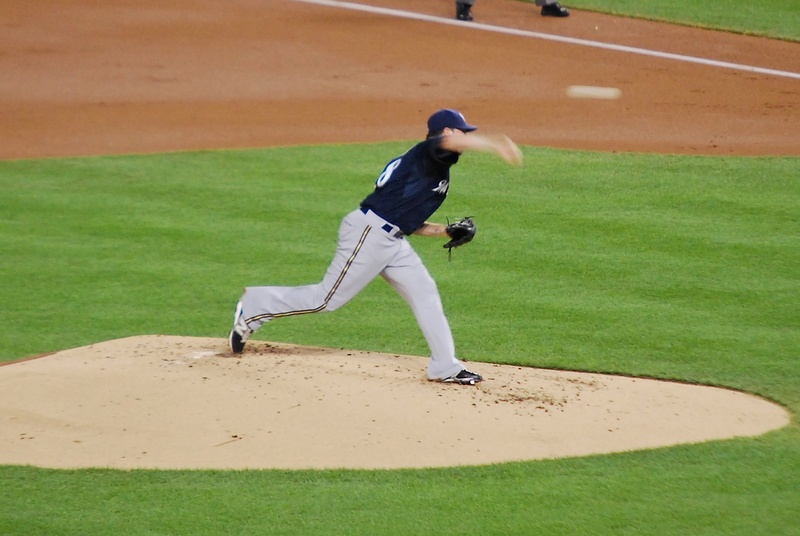 Axford pitched the 9th and notched his 32nd save. That three-run 9th is a thing of beauty. 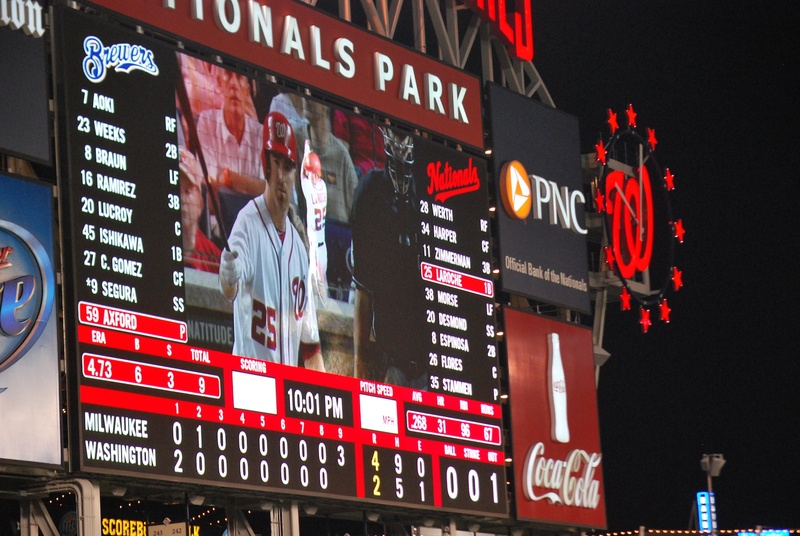 Final score: Brewers 4 – Nationals 2. Earlier in the day the Cardinals led the Cubs 4-2 in the bottom of the 9th and were one strike away from winning. What happened next? A bloop single, a game-tying 2-run home run (on a 1-2 pitch) and then a walk-off win in the 11th. Go Cubs Go! The Cardinals loss coupled with the Brewers win means the Cardinals’ lead in the second wild card chase is just 1.5 games (ONE in the loss column; you can’t make up losses). This post was kind of short but it’s a quick turnaround. The remaining three games of the series have 1:05, 1:35, and 1:05 start times, respectively. Let’s win some day games!! !